Forest Garden 6 x 8 Overlap Pressure Treated Apex Shed: This wooden garden shed is the ideal size at 6 x 8 and has been pressure treated in the factory for a long lasting lifespan. The shed is guaranteed against rot and fungal decay for 15 years and will not require the application of annual treatment which can be costly and time consuming. This garden shed from Forest Garden has been ethically sourced and is FSC certified for your assurance. 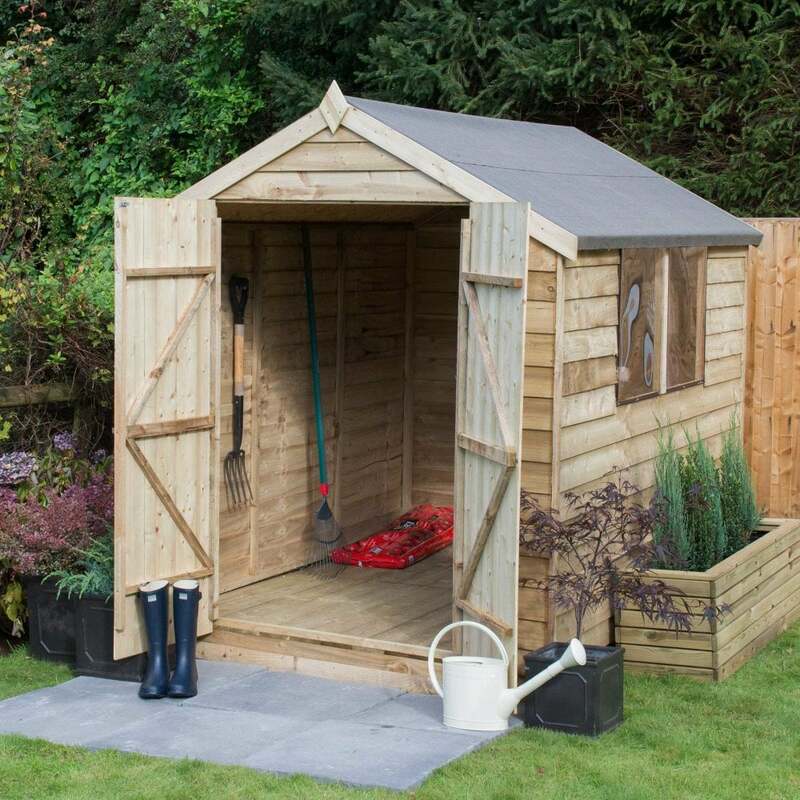 The shed has a durable pressure treated boarded floor and an OSB sheet material floor which is to be covered with the included shed felt for a waterproof finish. This shed has 2 windows to the side that can either be together in the left hand side or together in the right hand side and a double door to the front of the building. This shed has a traditional apex style roof which would suit any position in the garden whether it be next to another building or as a standalone in the garden. This shed has polycarbonate glazing which will not go brittle or break and a door with hidden hinges and a Z profile to provide it with additional strength and security. This shed is delivered to you in easy to manage sections which are simple to assemble using the included assembly guide.